Wrap up the day by sitting down to heart-healthy piece of Salmon “en papillote,”. This is just a fancy way of explaining a cooking method that happens to be so simple. It’s pretty much a fool proof way of cooking fish and veg. Cook each portion of fish in its own paper packet. 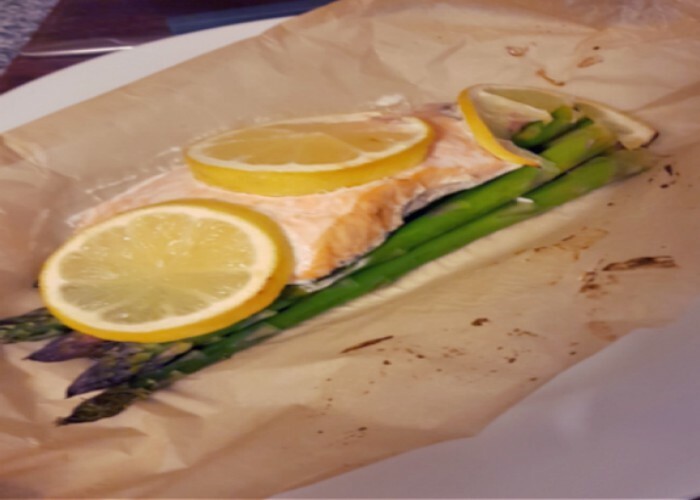 This recipe for Parchment Paper Baked Salmon with Asparagus and Lemon will only produce moist delicious salmon! I love this cooking technique because you can prepare these little packets ahead of time. So if you know you will be tight for time one evening, prep the packets the night before and bung them in the oven when you get home. Voilla…Beautiful fish 17 minutes later. Preheat your oven to 200C and place a large rectangular piece of parchment paper or baking paper on your work surface. Place about 8 to 10 asparagus spears in the center of the parchment paper. Place a salmon fillet over the asparagus, drizzle with a little bit of olive oil and some juice from the lemon, season with salt and pepper then top with 3 slices of lemon. Fold parchment paper over the salmon and seal the edges by making overlapping folds all around the edge. At the end, tuck the final crease under the pouch to secure the seal. Repeat 1 more time with remaining ingredients. Place pouches on a baking sheet. Bake in the preheated oven for 10 to 12 minutes. Remove from oven, let sit for 5 minutes and then carefully cut open the parchment paper.